Sunday, November 07:Holiday Beach reported a great day today with 840 Ruddy Ducks, 57 Sandhill Cranes, 98 Red-shouldered Hawks, 24 Golden Eagles and a Bohemian Waxwing. Ojibway's field trip to Pelee on Saturday had 55 Common Loons, several Surf Scoters, Red-shouldered Hawks and a Northern Goshawk at the tip. 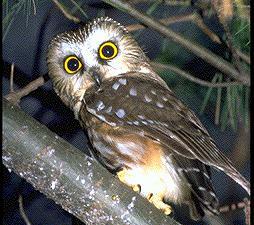 Two Northern Saw-whet Owls were seen perched in small cedars at the edge of the Sparrow Field. House Finch, Purple Finch, Pine Siskin and Common Redpoll were heard more than seen among the numerous flocks of American Goldfinches. Friday, November 05: Cave Swallows are being reported at Point Pelee, Erieau, Port Burwell and Long Point this morning. Hopefully a few will remain for the weekend. At Point Pelee Cave Swallows were seen at Sanctuary Pond (several) and flying south off the tip. Thursday, November 04: Up to two dozen Cave Swallows were found at Pelee yesterday!! In addition to the flock at the east side of the tip found by Kevin McLaughlin there were two birds found on Concession C outside the park and two birds roosting at the visitor centre found by Tom Hince. At least one bird was present this morning at the visitor centre and others have been reported from the base of the Marsh Boardwalk and Santuary Pond overlook. This appears to be part of a massive movement of Cave Swallows into northeastern North America. 21 Cave Swallows were seen at Old Cut Blvd. and the tip of Long Point, ON today and 20 were found in Cape May, New Jersey yesterday. Matt Baker reported two immature Golden Eagles over Lauzon Road and Highway 401 in Windsor today. While the cold front did not bring much more than a few snowflakes, an overnight frost finally killed off our garden's flowering bedding plants last night. Wednesday, November 03: There are some rewards to this sudden change in temperature. Kevin McLaughlin reported three Cave Swallows at the tip of Point Pelee today! Monday, November 01: The warm spell of the past week is due to end tonight. While it lasted we had many late reports of butterflies, dragonflies, snakes, turtles and even a few flowers. Randy Horvath saw two Golden Eagles at Wyandotte St. E. and Jefferson Ave. in Windsor today and Fred Urie reported a small movement of Red-tailed Hawks over Ojibway this afternoon and a late Common Buckeye butterfly along Titcombe Road. Betty Learmouth reported three Northern Goshawks were seen today at Holiday Beach. Peche Island was finally acquired by the City of Windsor today. The island will designated as parkland and managed by the Department of Parks and Recreation. Click here for October sightings.